The embattled Democrat is in deep doo-doo over his Countrywide sweetheart home loan deals, corporate bailout cash, and crony associations. New revelations by Countrywide whistle-blower Robert Feinberg confirm what more and more of Sen. Dodd’s constituents in Connecticut are coming to realize: He’s a lying crapweasel. Dodd denied knowledge of the special treatment the sub-prime mortgage company had given him and Senate Budget Committee Chairman Kent Conrad on home loans. (Dodd’s were worth more than $800,000). Feinberg flatly contradicted him in secret testimony on the Hill this week. Connecticut voters are not smiling about Dodd’s hypocritical bashing of lobbyists on the airwaves while he parties with them behind closed doors. And as they scrimp through the recession, they haven’t forgotten about Dodd’s dozy Irish cottage deal with convicted insider trader Edward Downe, Jr. (who received a Clinton pardon with Dodd’s generous help). Sandra Harris, an unaffiliated voter from West Hartford, told the Hartford Courant: “I’ve lost respect for him…It’s time for a change.” A Quinnipiac poll now shows that 60 percent of key independent voters disapprove of Dodd. But Dodd’s cratering numbers and mounting ethics scandal aren’t just about Dodd. Damaged birds of a feather flock together. Even before these latest disclosures, Dodd’s approval ratings had dropped to their lowest levels ever. 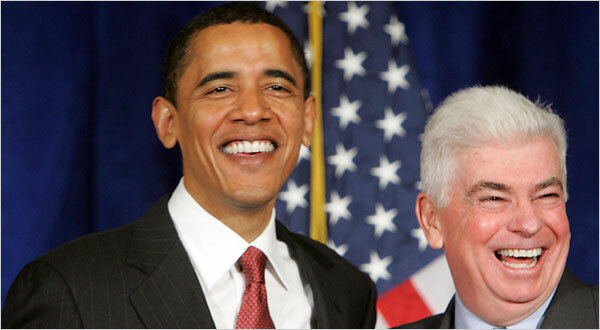 Yet, President Obama – agent of the “new politics,” erstwhile Breath of Fresh Air, guarantor of all that is good and clean in Washington — declared his support for Dodd’s 2010 re-election campaign bid. Obama progressives should cringe at their president’s bear hug of one of the most ethically-compromised politicians on Capitol Hill. The Beltway swamp is teeming with Democratic corruption scandals (Pennsylvania congressman John Murtha’s earmark factory and tax-subsidized airports and radars to nowhere; New York representative Charlie Rangel’s rent-controlled apartment scams and tax scandals; California representative Maxine Waters’s business ties to a minority-owned bank that received $12 million in TARP money under smelly circumstances, for starters). But Dodd’s career epitomizes the most fetid aspects of Washington’s culture of corruption. It’s a textbook case of nepotism, self-dealing, back-scratching, corporate lobbying, government favors, and entrenched incumbency. Two years later, Barack Obama declared his support for an entrenched U.S. Senator drowning in the decrepit old politics of pay-for-play. Two years later, at an “historic and “unprecedented” record pace, Barack Obama presided over a heap of botched nominations, crony appointments, lobbyist paybacks, union and left-wing activist payoffs, and abandoned promises to make government more transparent and accountable to ordinary Americans. “Washington is broken,” Obama lamented on the campaign trail. Yet, under President Obama, the business of Washington is booming. The collapse of the Era of HopeNChangeyness demonstrates the first and last law of political physics: As government grows, corruption flows. Massive new federal spending plus tens of thousands of pages of new regulations plus unprecedented new powers over taxpayers and the economy ensure limitless new opportunities for sleaze, favor-trading, deal-cutting, and influence-peddling. The president’s dwindling blind faithful may still cling to the belief that he can work miracles. But no one, not even Barack Obama, can drain a swamp by flooding it. Michelle Malkin is author of the just-released Culture of Corruption: Obama and His Team of Tax Cheats, Crooks, and Cronies (Regnery). Update: Dodd is resisting subpoenas for his Countrywide VIP loan deals. Update: Dodd announced he’s having surgery for prostate cancer.